Derek Lam's black stretch tech-jersey trousers are designed with a flared silhouette. Flat front. Darting at back. Mock besom back pockets. 8.5 rise, 36.0 inseam, 18.0 leg opening (approximately). Zip fly. Jigger button. Hook-and-bar closure. Available in Black. 83% viscose, 12% polyamide, 5% elastane. Dry clean. Imported. Our model is 5'10/178cm and wearing a size 38 IT. 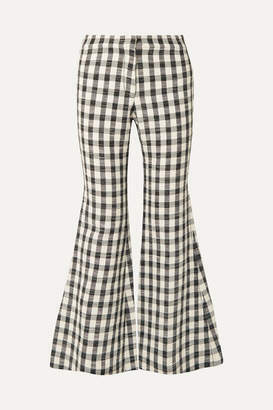 Derek Lam Women's Tech-Jersey Flared Trousers - Black Size 40 IT A great designer gift. Shop Derek Lam at Barneys New York.